/BigMIND /Partners 2.0 (BigMIND) /Partners 2.0 (BigMIND) / Partners How To / As a BigMIND Partner, How Can I Change my Users’ Accounts Plans? 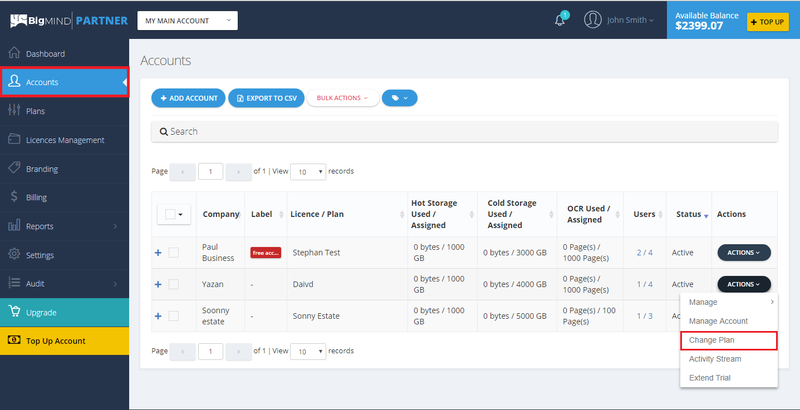 As a BigMIND Partner (White labeled or not), you could have direct User Account Management from the Accounts section of your Partner portal. To change the plan of any account, first you need to make sure that the new plan is already available and created within the Plans section of your Partner portal. This article shows you how to do so. Sign into the Partner system. On the left-hand pane, click on Accounts. A list of all your added accounts will be shown. Click the Actions button of the account you want to upgrade its plan → Change Plan. A Change Plan pop-up box will be shown. Select the new plan to upgrade to it → Submit.